As we anxiously and ambitiously set out 40 chairs for our first event, knowing we would be over the moon if 20 people came, we did not expect an hour later to have over 70 people crammed into the space with standing room only! Oh the joy of watching a community come together. I help run a community event in the north-east of England called Stockton SOUP. Originating in Detroit, but now all over the world, SOUP is a simple concept. People turn up and make a suggested donation which gets them a bowl of soup, roll and a vote. After some live music, four people pitch an idea to improve the local community. They may only talk for four minutes, and when they have finished everyone votes for their favourite. The donations are then split proportionally according to the vote. It is crowd funding that comes directly from the crowd. As I reflect on that first stuffy, cramped space full of people from all walks of life, backgrounds, faiths, ages and genders – amazing, diverse people who turn up time and time again with one common goal of making their community better – and then consider the theatre we now see filled regularly, I am reminded of 1 Corinthians 12:14: ‘Even so the body is not made up of one part but of many.’ There is something so special about seeing a community come together to celebrate and support people stepping out to make a difference, or seeing people who regularly attend the events to cheer on their community heroes. Thanks to this collective body working as one we have seen ideas planted and grown, and more established projects go from strength to strength. It is amazing what can be achieved when we all get together and work together for the common good. When all the admin has been done, the room laid out, and the mic checked, I get to sit back and watch – watch someone’s dream get cheered on, believed in, and encouraged by their own community! The money is a bonus; that support is life changing. Teamwork really does make the dreams work! Emily Lee is a foster carer from Stockton-on-Tees. 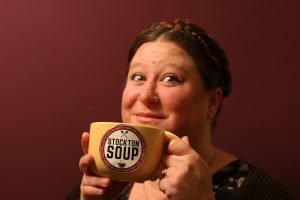 In 2016, with the support of her friends and inspired by other SOUP events, she established Stockton SOUP. To date they have given away over £6000 to local community projects. Watch Jonathan’s 40acts story as inspiration for today’s challenge! What change could you club together for?